This past weekend we decided we needed to recreate Sea Girt’s Joe Leone’s roasted tomatoes. This recipe beats their’s hands down. 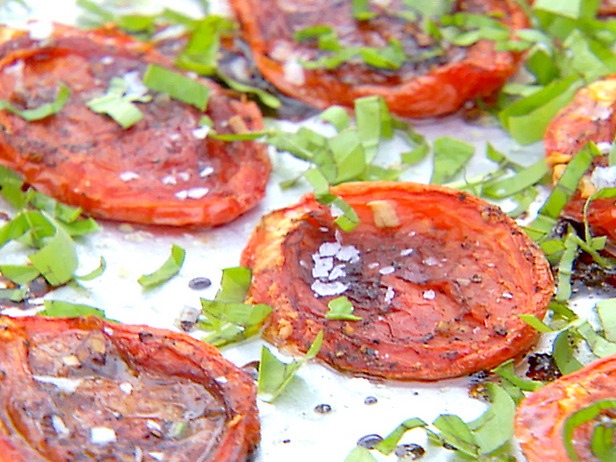 Preheat the oven to 450 degrees F.Arrange the tomatoes on a sheet pan, cut sides up, in a single layer. Drizzle with olive oil and balsamic vinegar. Sprinkle the garlic, sugar, salt, and pepper over the tomatoes. Roast for 25 to 30 minutes, until the tomatoes are concentrated and beginning to caramelize. Serve warm or at room temperature. This entry was posted in Recipes, Summer 2011 and tagged Recipes. Bookmark the permalink. sounds really good. and easy. and only a tiny bit of gout. These were very good. Saw another really good recipe for tomatoes from Martha that we have to try– tomato and cheese tarts. Using the store bought pastry dough, cut out rounds, add shredded cheese (mozzarella or fontina), add slice of tomato, brush with olive oil, salt and pepper and bake. Looked really good.